Digitization prices vary based on quantity, size and resolution of photographs. This service is batch scanning, and not suitable for high quality reproduction. For high quality, individualized scans, please contact. For quantities smaller than 25 please inquire. Below prices are for images scanned at 300dpi. Add $0.05/image for 600dpi. For larger prints, (greater than 5" x 7" and smaller than 8" x 10" ) the price includes 600dpi resolution. Larger than 8" x 10", contact for a quote. 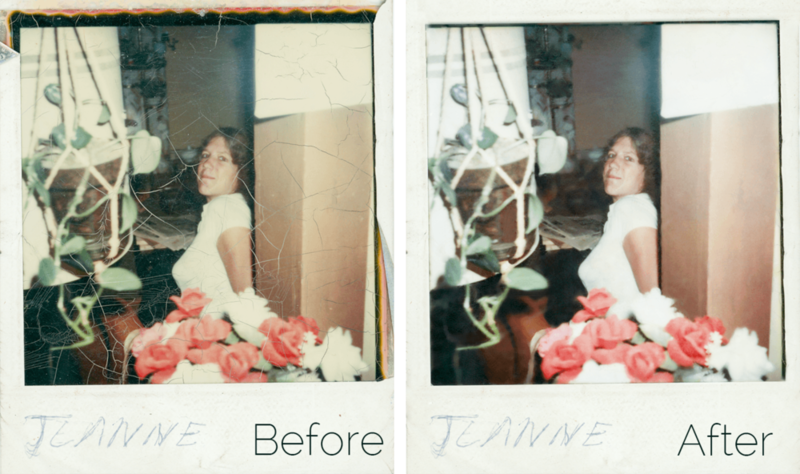 We are able to remove stains, tears and creases, remake parts of photographs that have been removed, fix badly faded images to restore vibrant colors, and even add color into a photograph that was shot originally in black & white. We can then provide you with the file, or make you a premium photographic inkjet print to replace your damaged one! Because each photograph is unique, please contact us for a quote. We are pleased to offer high quality inkjet prints! Whether you have slides or negatives that you'd like a print of, or a damaged photo that you want us to repair and reprint, we can do it. For pricing, please check the main pricing page for Color Space Photographic. We will transfer your files for free using the file transfer system of your choice online (Dropbox, WeTransfer, Google Drive, etc.) If you'd prefer a hard copy of the files, we can provide you with an archival DVD ($5), a USB thumb drive ($10/8gb, $15/16gb), or you can provide us with your own for no extra charge. For more information about the services we provide, please visit our SERVICES page.